Sometimes a sale is more than just a sale. I was delighted to be asked to give my permission to use my image of Gold and purple organ pipes by a publisher who wanted it for an anthology of organ music. It was a special thrill since one of my passions is music, and specifically organ music. So here was a triple whammy. This image will reach many people (I hope!) and I am just delighted that it really helped the designers create the sort of cover they were looking for. Everyone wins! The trouble is, life is so full at the moment it is hard to sit down and think how to describe it! My brother visited this website a few days ago and noticed I hadn't blogged in a long, long time. He was a little cross at me I think, but was very nice about it. He was right - a quiet, lapsed blog is not a pretty site. So I will try to be a good girl and make this one of my resolutions for the New Year - blog blog blog. Right for starters: A nice bit of news. 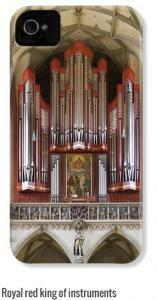 I just sold a picture of the pipe organ one our my favourite places, Castle Ashby in the UK . Thank you to the buyer - I hope you enjoy having it one your wall - and perhaps we may meet one day soon, as I will be at your lovely church in June this year! So - that was a pleasant start to 2018 - I wish all my readers a similar frisson to propel them forward. Plus loads of health and general happiness of course. 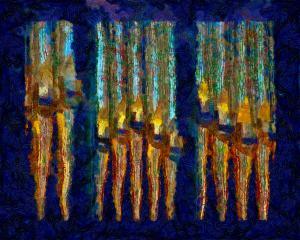 When you try to depict one of the world's largest pipe organs, the problem is: how? Scale and a sense of size is very difficult to get across to the viewer. But with this image I was able to show that, mainly through the diminutive figure of the organist sitting at the console. The organ is the Hill pipe organ in the Sydney Town Hall, Australia, and is one of the largest in the world. Note especially the size of the large front pipes. Certainly an organ you could take home and put in your front sitting room. So I was very pleased to get a notice this morning that someone has bought a print of this image - and I hope they enjoy it. Thanks guys! Delighted to return home from another European concert tour to news of a sale. 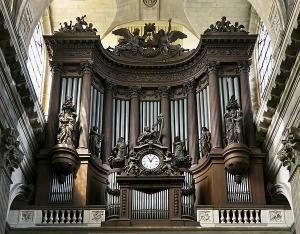 This is one of my favourite organs - the Cavaille-Coll organ in St Sulpice in Paris, France. It seems to be popular with other organ lovers too! I have garnered many more images from my latest travels in the UK, Germany and Switzerland, so I will be busily working on these ready for posting within the next couple of months. It must be Spring! I have made a number of small sales recently such as this image of the organ pipes in Ruthin, Wales, UK, so I thought I would celebrate with a 50% discount sale off all of my photographs until the end of June. 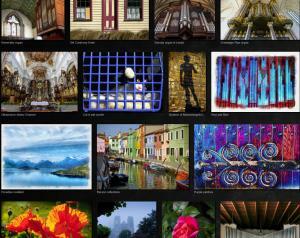 Explore my site and don't forget that although I have more images of pipe organs than any other one subject, there ARE other things that take my fancy too! If there are any organs that are not featured in my collection (and I have many yet to process and upload) please feel free to email me and ask, and I will see if I can help. When you check out, don't forget to put in the 50% discount code of CNJVYK to qualify for the savings! Thank you to the buyer of the card with this image. 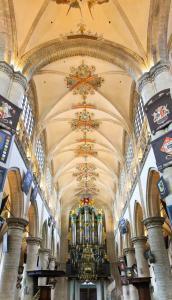 The Grote Kerk, in Breda, the Netherlands, really is an impressive space, from the moment you walk in. 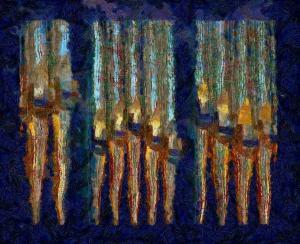 The crowning glory is the organ which is is a variety of bright, deep colours - greens, blues, reds. 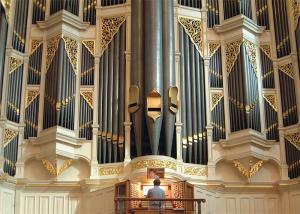 The original organ was built in 1534 by Niehoff, and it was last rebuilt by Van den Heuvel in 2000. It has 53 stops, 4 manuals and pedal and in total has 3780 pipes. 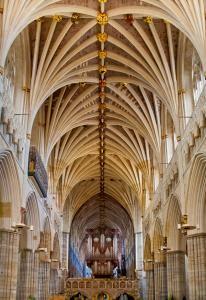 It was the amazing symmetry of this view inside the cathedral in Exeter, England, which first hooked my eye. The vaulting and the ceiling bosses all leading to the Loosemore organ case in the distance created both a grandeur and a point to the photo. And I love the warm, rich colours of the stone. The four-manual organ on the triforium is enclosed in a case that was built in 1665, although the modern instrument inside the case was last restored and added to in 2003 by the English organ builders, Harrison and Harrison. Thanks to the buyer in VA.
Post-processing with HDR results in a rather spooky view of this already surreal organ in St Bertrand de Comminges, in France. This particular organ was in fact featured in a ghost story by M R James, called "Canon Alberic's Scrap-Book", but in real life is simply magnificent. The heavily carved organ case matches the world-famous choir stalls which are believed top be the work of Nicolas Bachelier. The organ itself dates from around 1550, and after undergoing many changes and adaptations over the centuries now sports 3 manuals and pedals, with 31 stops and 47 ranks. It is also unusual in that it is built in the corner of a church rather than along a wall. Thanks to the buyer in Brooklyn Park, Mn, USA, and I hope you enjoy your new purchase! I have heard this organ in concert, in Dinkelsbuehl, Germany, and know how lovely it can sound. Just as lovely, only visually, is the brilliant red and silver case that sets off the organ pipes. It was built by the world-famous organ builders of Austria, Rieger-Orgelbau, who also built our three-manual organ in Christchurch, New Zealand, which is now sadly unusable because the auditorium it is in is closed for earthquake repairs. Meanwhile, the Dinkelsbuehl instrument makes a stunning iPhone Case too, so I hope the recipient in Germany will agree! Thanks to the buyer.